At the time of the construction of the station, Battersea was mostly associated with industry and poor working people. 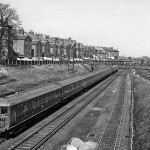 Clapham, a mile to the east of the site, was a longer-established and more fashionable village and the railway companies, seekimg to attract a middle and upper class clientele, adopted the grander of the two names. Debate still rages if this explanation is correct. I am here to complain about the roadworks at Clapham Junction . THere are now no traffic lights in order for pedestrians can cross. All of them been covered by an orange plastic . The only working lights in front of the entrance at Clapham Junction station were mysteriously taken off and pointing to the unusable lights down near Falcon Road. Not only are there roadworks happening everywhere there is no place for PUBLIC to actually cross. There has been near accidents involving cars/buses and people. Its just an accident waiting to happen. I think a country who is hosting the up coming Olympic cant even organise roadworks properly its a disgrace. Up the street in Northcote Road there is lights working but they have put barriers for pedestrians to still be able to walk. One block down and its chaos . This has been a long time and its not on perhaps health and safety is out the window where the GENERAL PUBLIC is concerned. Get some lights working !!! before someone dies!